Tiberius Gracchus was born about the year 164 b.c. He was one of twelve children, nine of whom died in infancy, himself, his brother Caius, and his sister Cornelia being the only survivors. His family was plebeian, but of high antiquity, his ancestors for several generations having held the highest offices in the Republic. On the mother's side he was the grandson of Scipio Africanus. His father, after a distinguished career as a soldier in Spain and Sardinia, had attempted reforms at Rome. He had been censor, and in this capacity he had ejected disreputable senators from the Curia; he had degraded offending Equites; he had rearranged and tried to purify the Comitia. But his connections were aristocratic. 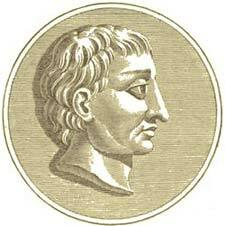 His wife was the daughter of the most famous of them, Scipio Africanus the Younger. He had been himself in antagonism with the tribunes, and had taken no part, at any time, in popular agitations. The father died when Tiberius was still a boy, and the two brothers grew up under the care of their mother, a noble and gifted lady. They early displayed remarkable talents. Tiberius, when old enough, went into the army, and served under his brother-in-law in the last Carthaginian campaign. He was first on the walls of the city in the final storm. Ten years later he went to Spain as quaestor, when he carried on his father's popularity, and by taking the people's side in some questions, fell into disagreement with his brother-in-law. His political views had perhaps already inclined to change. He was still of an age when indignation at oppression calls out a practical desire to resist it. On his journey home from Spain he witnessed scenes which confirmed his conviction and determined him to throw all his energies into the popular cause. His road lay through Tuscany, where he saw the large estate system in full operation--the fields cultivated by the slave gangs, the free citizens of the Republic thrust away into the towns, aliens and outcasts in their own country, without a foot of soil which they could call their own. In Tuscany, too, the vast domains of the landlords had not even been fairly purchased. They were parcels of the ager publicus, land belonging to the state, which, in spite of a law forbidding it, the great lords and commoners had appropriated and divided among themselves. Five hundred acres of state land was the most which by statute any one lessee might be allowed to occupy. But the law was obsolete or sleeping, and avarice and vanity were awake and active. Young Gracchus, in indignant pity, resolved to rescue the people's patrimony. He was chosen tribune in the year 133. His brave mother and a few patricians of the old type encouraged him, and the battle of the revolution began. The Senate, as has been said, though without direct legislative authority, had been allowed the right of reviewing any new schemes which were to be submitted to the Assembly. The constitutional means of preventing tribunes from carrying unwise or unwelcome measures lay in a consul's veto, or in the help of the College of Augurs, who could declare the auspices unfavorable and so close all public business. These resources were so awkward that it had been found convenient to secure beforehand the Senate's approbation, and the encroachment, being long submitted to, was passing by custom into a rule. But the Senate, eager as it was, had not yet succeeded in engrafting the practice into the constitution. On the land question the leaders of the aristocracy were the principal offenders. Disregarding usage, and conscious that the best men of all ranks were with him, Tiberius Gracchus appealed directly to the people to revive the Agrarian law. His proposals were not extravagant. That they should have been deemed extravagant was a proof of how much some measure of the kind was needed. Where lands had been enclosed and money laid out on them, he was willing that the occupants should have compensation. But they had no right to the lands themselves. Gracchus persisted that the ager publicus belonged to the people, and that the race of yeomen, for whose protection the law had been originally passed, must be re-established on their farms. No form of property gives to its owners so much consequence as land, and there is no point on which in every country an aristocracy is more sensitive. The large owners protested that they had purchased their interests on the faith that the law was obsolete. They had planted and built and watered with the sanction of the government, and to call their titles in question was to shake the foundations of society. The popular party pointed to the statute. The monopolists were entitled in justice to less than was offered them. They had no right to a compensation at all. Political passion awoke again after the sleep of a century. The oligarchy had doubtless connived at the accumulations. The suppression of the small holdings favored their supremacy, and placed the elections more completely in their control. Their military successes had given them so long a tenure of power that they had believed it to be theirs in perpetuity; and the new sedition, as they called it, threatened at once their privileges and their fortunes. The quarrel assumed the familiar form of a struggle between the rich and the poor, and at such times the mob of voters becomes less easy to corrupt. They go with their order, as the prospect of larger gain makes them indifferent to immediate bribes. It became clear that the majority of the citizens would support Tiberius Gracchus, but the constitutional forms of opposition might still be resorted to. Octavius Caecina, another of the tribunes, had himself large interests in the land question. He was the people's magistrate, one of the body appointed especially to defend their rights, but he went over to the Senate, and, using a power which undoubtedly belonged to him, he forbade the vote to be taken. 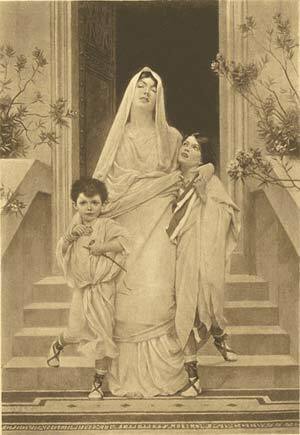 The Mother Of The Gracchi. There was no precedent for the removal of either consul, praetor, or tribune, except under circumstances very different from any which could as yet be said to have arisen. The magistrates held office for a year only, and the power of veto had been allowed them expressly to secure time for deliberation and to prevent passionate legislation. But Gracchus was young and enthusiastic. Precedent or no precedent, the citizens were omnipotent, he invited them to declare his colleague deposed. They had warmed to the fight, and complied. A more experienced statesman would have known that established constitutional bulwarks cannot be swept away by a momentary vote. He obtained his Agrarian law. Three commissioners were appointed, himself, his younger brother, and his father-in-law, Appius Claudius, to carry it into effect; but the very names showed that he had alienated his few supporters in the higher circles, and that a single family was now contending against the united wealth and distinction of Rome. The issue was only too certain. Popular enthusiasm is but a fire of straw. In a year Tiberius Gracchus would be out of office. Other tribunes would be chosen more amenable to influence, and his work could then be undone. He evidently knew that those who would succeed him could not be relied on to carry on his policy. He had taken one revolutionary step already; he was driven on to another, and he offered himself illegally to the Comitia for re-election. It was to invite them to abolish the constitution, and to make him virtual sovereign; and that a young man of thirty should have contemplated such a position for himself as possible, is of itself a proof of his unfitness for it. The election day came. The noble lords and gentlemen appeared in the Campus Martius with their retinues of armed servants and clients; hot-blooded aristocrats, full of disdain for demagogues, and meaning to read a lesson to sedition which it would not easily forget. Votes were given for Gracchus. Had the hustings been left to decide the matter, he would have been chosen; but as it began to appear how the polling would go, sticks were used and swords; a riot rose, the unarmed citizens were driven off, Tiberius Gracchus himself and three hundred of his friends were killed, and their bodies were flung into the Tiber. Thus the first sparks of the coming revolution were trampled out. But though quenched and to be again quenched with fiercer struggles, it was to smoulder and smoke and burst out time after time, till its work was done. Revolution could not restore the ancient character of the Roman nation, but it could check the progress of decay by burning away the more corrupted parts of it. It could destroy the aristocracy and the constitution which they had depraved, and under other forms preserve for a few more centuries the Roman dominion. Scipio Africanus, when he heard in Spain of the end of his brother-in-law, exclaimed "May all who act as he did perish like him!" There were to be victims enough and to spare before the bloody drama was played out. Quiet lasted for ten years, and then, precisely when he had reached his brother's age, Caius Gracchus came forward to avenge him, and carry the movement through another stage. Young Caius had been left one of the commissioners of the land law; and it is particularly noticeable that, though the author of it had been killed, the law had survived him, being too clearly right and politic in itself to be openly set aside. For two years the commissioners had continued to work, and in that time forty thousand families were settled on various parts of the ager publicus, which the patricians had been compelled to resign. This was all which they could do. The displacement of one set of inhabitants and the introduction of another could not be accomplished without quarrels, complaints, and perhaps some injustice. Those who entered on possession were not always satisfied. The commissioners became unpopular. When the cries against them became loud enough, they were suspended, and the law was then quietly repealed. The Senate had regained its hold over the Assembly, and had a further opportunity of showing its recovered ascendency when, two years after the murder of Tiberius Gracchus, one of his friends introduced a bill to make the tribunes legally re-eligible. Caius Gracchus actively supported the change, but it had no success; and, waiting till times had altered, and till he had arrived at an age when he could carry weight, the young brother retired from politics, and spent the next few years with the army in Africa and Sardinia, he served with distinction; he made a name for himself, both as a soldier and an administrator. Had the Senate left him alone, he might have been satisfied with a regular career, and have risen by the ordinary steps to the consulship. But the Senate saw in him the possibilities of a second Tiberius; the higher his reputation, the more formidable he became to them. They vexed him with petty prosecutions, charged him with crimes which had no existence, and at length, by suspicion and injustice, drove him into open war with them. Caius Gracchus had a broader intellect than his brother, and a character considerably less noble. The land question he perceived was but one of many questions. The true source of the disorders of the commonwealth was the Senate itself. The administration of the empire was in the hands of men totally unfit to be trusted with it, and there he thought the reform must commence. He threw himself on the people, he was chosen tribune in 123, ten years exactly after Tiberius. He had studied the disposition of parties. He had seen his brother fall because the Equites and the senators, the great commoners and the nobles, were combined against him. He revived the Agrarian law as a matter of course, but he disarmed the opposition to it by throwing an apple of discord between the two superior orders. The high judicial functions in the commonwealth had been hitherto a senatorial monopoly. All cases of importance, civil or criminal, came before courts of sixty or seventy jurymen, who, as the law stood, must be necessarily senators. The privilege had been extremely lucrative. The corruption of justice was already notorious, though it had not yet reached the level of infamy which it attained in another generation. It was no secret that in ordinary causes jurymen had sold their verdicts, and, far short of taking bribes in the direct sense of the word, there were many ways in which they could let themselves be approached, and their favor purchased. A monopoly of privileges is always invidious. A monopoly in the sale of justice is alike hateful to those who abhor iniquity on principle, and to those who would like to share the profits of it. But this was not the worst. The governors of the provinces, being chosen from those who had been consuls or praetors, were necessarily members of the Senate. Peculation and extortion in these high functions were offences, in theory, of the gravest kind; but the offender could only be tried before a limited number of his peers, and a governor who had plundered a subject state, sold justice, pillaged temples, and stolen all that he could lay hands on, was safe from punishment if he returned to Rome a millionnaire and would admit others to a share in his spoils. The provincials might send deputations to complain, but these complaints came before men who had themselves governed provinces, or else aspired to govern them. It had been proved in too many instances that the law which professed to protect them was a mere mockery. Caius Gracchus secured the affections of the knights to himself, and some slightly increased chance of an improvement in the provincial administration, by carrying a law in the Assembly disabling the senators from sitting on juries of any kind from that day forward, and transferring the judicial functions to the Equites. How bitterly must such a measure have been resented by the Senate, which at once robbed them of their protective and profitable privileges, handed them over to be tried by their rivals for their pleasant irregularities, and stamped them at the same time with the brand of dishonesty! How certainly must such a measure have been deserved when neither consul nor tribune could be found to interpose his vote! Supported by the grateful knights, Caius Gracchus was for the moment all-powerful. It was not enough to restore the Agrarian law. He passed another aimed at his brother's murderers, which was to bear fruit in later years, that no Roman citizen might be put to death by any person, however high in authority, without legal trial, and without appeal, if he chose to make it, to the sovereign people. A blow was thus struck against another right claimed by the Senate, of declaring the Republic in danger, and the temporary suspension of the constitution. These measures might be excused, and perhaps commended; but the younger Gracchus connected his name with another change less commendable, which was destined also to survive and bear fruit. He brought forward and carried through, with enthusiastic clapping of every pair of hands in Rome that were hardened with labor, a proposal that there should be public granaries in the city, maintained and filled at the cost of the state, and that corn should be sold at a rate artificially cheap to the poor free citizens. Such a law was purely socialistic. The privilege was confined to Rome, because in Rome the elections were held, and the Roman constituency was the one depositary of power. The effect was to gather into the city a mob of needy unemployed voters, living on the charity of the state, to crowd the circus and to clamor at the elections, available no doubt immediately to strengthen the hands of the popular tribune, but certain in the long run to sell themselves to those who could bid highest for their voices. Excuses could be found, no doubt, for this miserable expedient, in the state of parties, in the unscrupulous violence of the aristocracy, in the general impoverishment of the peasantry through the land monopoly, and in the intrusion upon Italy of a gigantic system of slave labor. But none the less it was the deadliest blow which had yet been dealt to the constitution. Party government turns on the majorities at the polling places, and it was difficult afterward to recall a privilege which, once conceded, appeared to be a right. The utmost that could be ventured in later times, with any prospect of success, was to limit an intolerable evil, and if one side was ever strong enough to make the attempt, their rivals had a bribe ready in their hands to buy back the popular support. Caius Gracchus, however, had his way, and carried all before him. He escaped the rock on which his brother had been wrecked. He was elected tribune a second time. He might have had a third term if he had been contented to be a mere demagogue. But he, too, like Tiberius, had honorable aims. The powers which he had played into the hands of the mob to obtain, he desired to use for high purposes of statesmanship, and his instrument broke in his hands. He was too wise to suppose that a Roman mob, fed by bounties from the treasury, could permanently govern the world. He had schemes for scattering Roman colonies, with the Roman franchise, at various points of the empire. Carthage was to be one of them. He thought of abolishing the distinction between Romans and Italians, and enfranchising the entire peninsula. These measures were good in themselves--essential, indeed, if the Roman conquests were to form a compact and permanent dominion. But the object was not attainable on the road on which Gracchus had entered. The vagabond part of the constituency was well contented with what it had obtained, a life in the city, supported at the public expense, with politics and games for its amusements. It had not the least inclination to be drafted off into settlements in Spain or Africa, where there would be work instead of pleasant idleness. Carthage was still a name of terror. To restore Carthage was no better than treason. Still less had the Roman citizens an inclination to share their privileges with Samnites and Etruscans, and see the value of their votes watered down. Political storms are always cyclones. The gale from the east to-day is a gale from the west to-morrow. Who and what were the Gracchi, then?--the sweet voices began to ask--ambitious intriguers, aiming at dictatorship, or perhaps the crown. The aristocracy were right, after all; a few things had gone wrong, but these had been amended. The Scipios and Metelli had conquered the world: the Scipios and Metelli were alone fit to govern it. Thus, when the election time came round, the party of reform was reduced to a minority of irreconcilable radicals, who were easily disposed of. Again, as ten years before, the noble lords armed their followers. Riots broke out and extended day after day. Caius Gracchus was at last killed, as his brother had been, and under cover of the disturbance three thousand of his friends were killed along with him. The power being again securely in their hands, the Senate proceeded at their leisure, and the surviving patriots who were in any way notorious or dangerous were hunted down in legal manner, and put to death or banished.